It takes a while for things to change. Patience and faith, they say. I can’t wait. I won’t, I say. 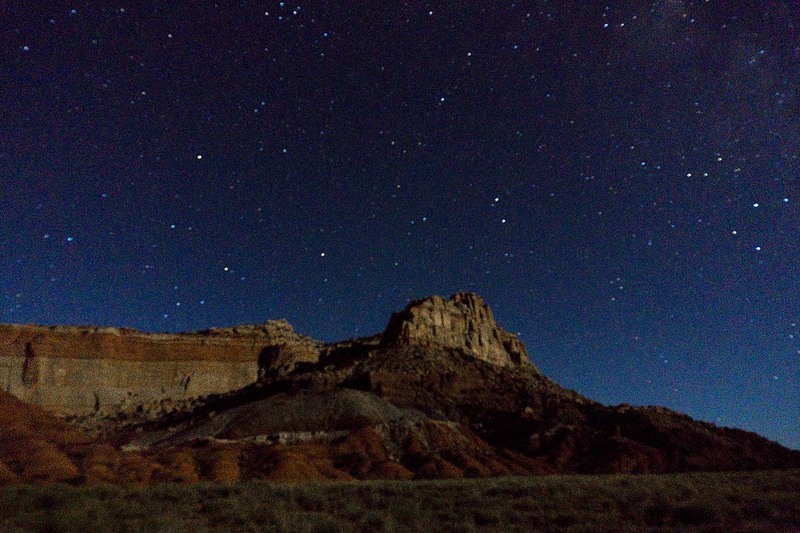 Stars above Grand Wash Capitol Reef. Deep time puts the age of Earth at four-and-one-half billion years. 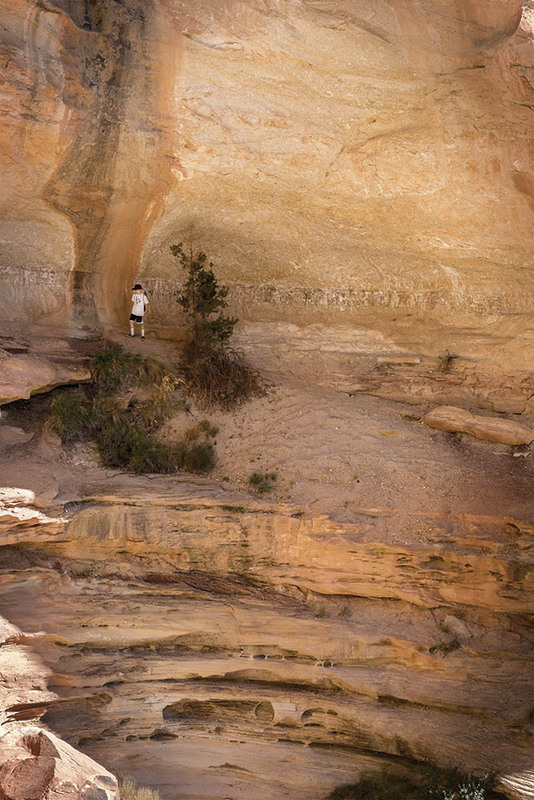 Named after Joseph Hickman, Hickman natural bridge is 133 feet long and 125 feet high. I sense immense distance in Earth’s span, yet the years mean nothing in comprehending the patterns of death and life and death again which deposit layers of yesterdays upon tomorrows, until all that remains is this moment. I stand in a place where the evidence of change surrounds me, yet actual change can not be seen. for a million, maybe a billion years, for me to walk this path. Red dirt sticks to my shoes and I carry it with me in defiance of the law of long waits. The Freemont river cuts a valley just below Capitol Dome. The wind soughs and the rocks speak in whispers. I stand still and listen. The words do not bring me comfort. Change is as the rocks. 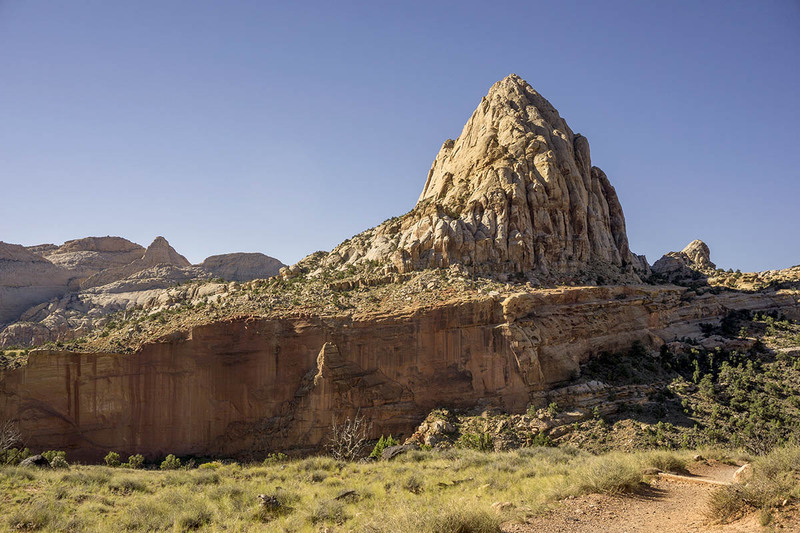 Capitol Dome, Capitol Reef National Park. 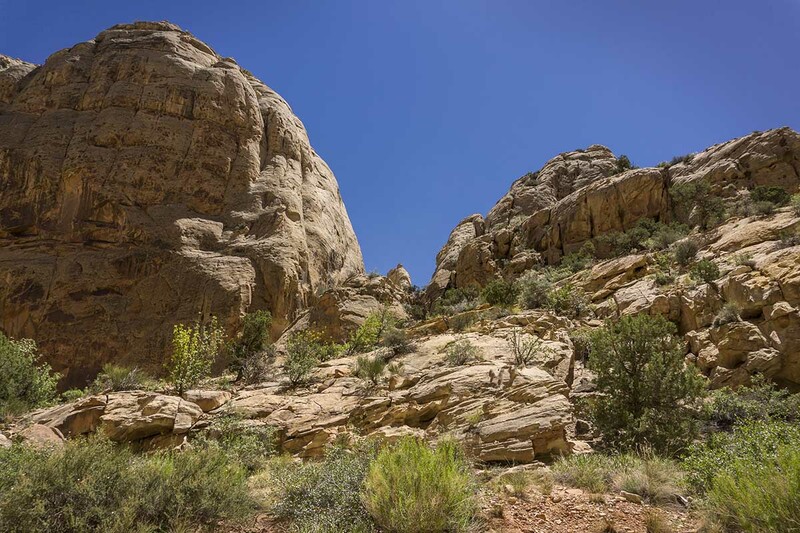 I look up at the sandstone sentinels and the sky stretches out before me. I am small, insignificant, tenuous. I look down and a silver stream glints below towering canyon walls. My heart skips a beat and I step back from the ledge. I have climbed much higher than I realize. Davy scales the cliffs near Hickman Bridge bowl. My breath catches as my son scales the cliffs below me. The rocks he climbs are hard broken. I call out not to walk those rocks, they may crumble. He has not yet reached the precipice on which I stand and must choose his path. I squint in harsh sunlight and see myself in his approaching shadow. not so old, in that the elements which make up my frame have not yet been scattered by hot winds relentlessly carving through stone. My son will climb much higher than I have steps remaining. Yet, I still have steps remaining. And the Gods said, “Let it be so.” And they watched those things which they had ordered until they obeyed. For even the Gods must watch and wait. 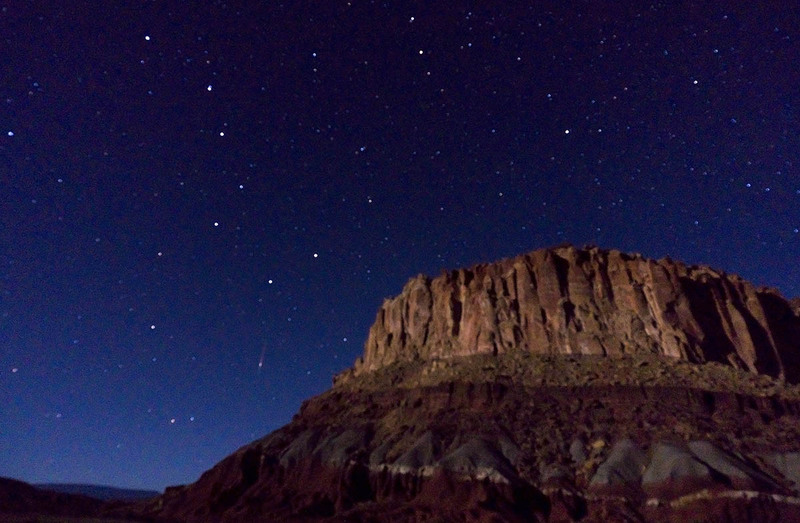 The Big Dipper rises above Grand Wash Wind Gate in Capitol Reef. In the vast continuum of eternity, patience and faith take time. 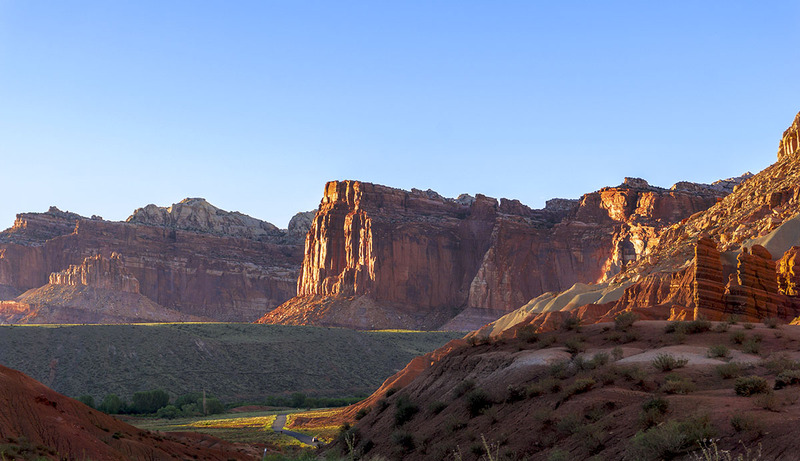 Towering sentinels of Capitol Reef. Wistfully, I lift a handful of dust and toss it to the sky. The wind accepts my offering. My time has come. I have touched the rock of ages and must not linger. the changes I hope for are carving the canyons of my soul. Looking up at Hickman Bridge. Red dirt gives way to azure skies. Worn ragged by the forces of nature, this rock came to rest at the bottom of a cliff as a wrecked ship rests on the sea bottom. Among the aging sandstone some forms of live thrive, others pass out of existence. Evidence indicates that in a flash flood, Grand Wash is not the place to be. Very little water and harsh conditions favor plants which learn to adapt. Morning sun rises over Hickman Bridge. 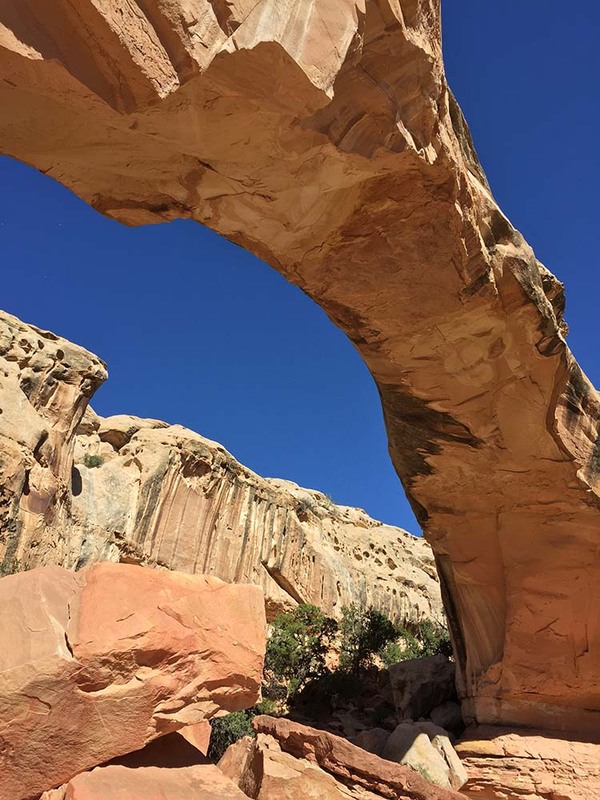 Weather sandstone makes for interesting trail markers on the Hickman Bridge trail in Capitol Reef. Anne and Davy stand below 125 foot high Hickman Bridge. Red dirt still glows just after sunset in Capitol Reef National Park. Moon sets over Capitol Reef National Park. View of Chimney Rock Capitol Reef. 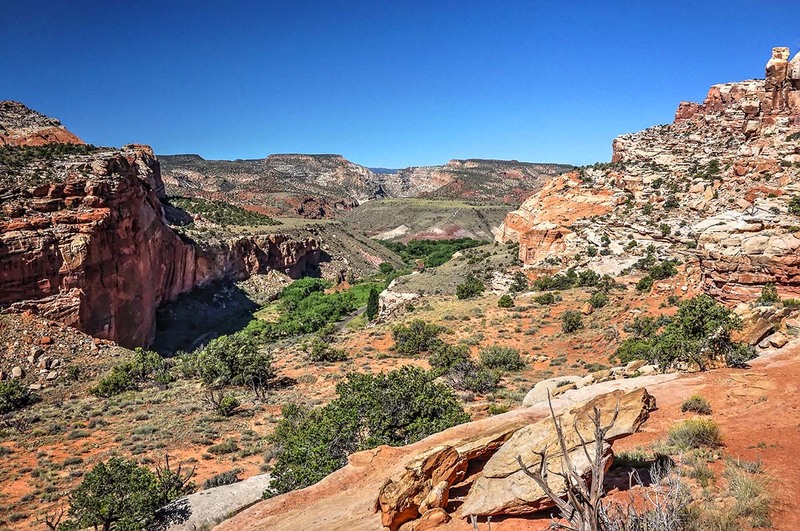 Verdant valleys contrast the sandstone cliffs of Capitol Reef National Park. Trees provide welcome shade at the Fuita Campground in Capitol Reef National Park. Apple orchards thrive in the valleys of Capitol Reef National Park. Apple orchards thrive in the valleys of Capitol Reef.